In the past she has filled those empty days with soccer, swim, gymnastics, music, and art classes. This summer we’ll be trying t-ball. She’s got a lot going on. And it is awesome, we love it, and we are happy! So why do we do it? There are a few reasons. She Enjoys It: Avery loves all of the activities she participates in. If she didn’t, we wouldn’t continue. We do not quit, as I strongly believe that you finish a session/season and want to teach her this. But, if you don’t like something, you do not have to do it again next session. If we miss a class due to being out of town, or a holiday, Avery notices, and is bummed out about it. She enjoys her activities, and wants to participate. And, while she is a busy bee, she still has plenty of “down-time” to relax, and hang out at home. She Makes Friends: Of course she already has school friends, and mom’s group friends, but I love that through these other activities she gets to meet even more kids! 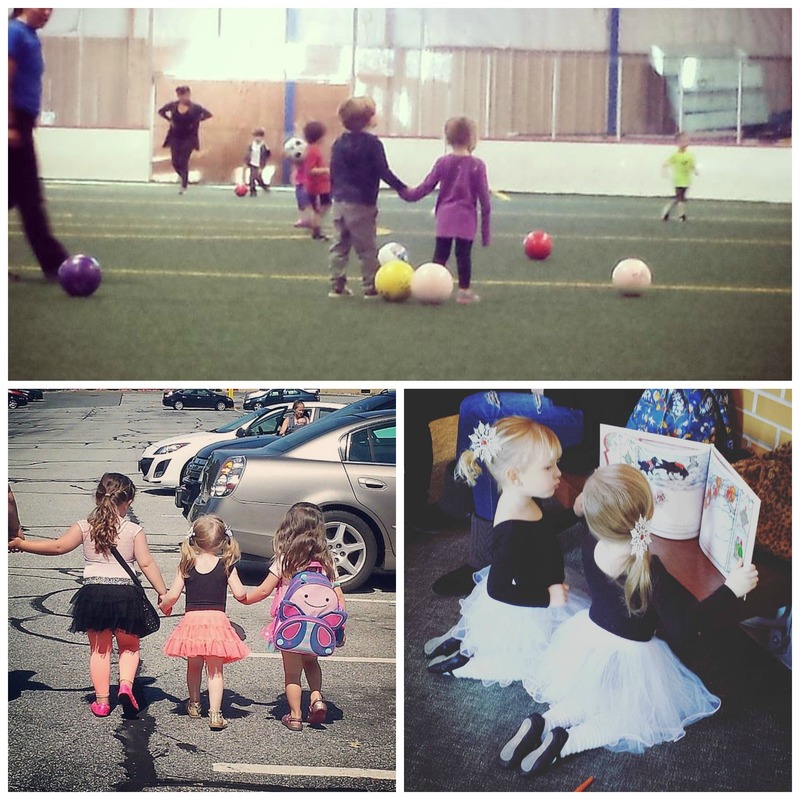 She has met some of her very best friends in dance classes. I get to meet new people and make new friends, too! Working from home, it’s very nice for me to get out and have some adult interaction every day! Everybody wins!! She’s Fearless & Confident: Every activity she has participated in has taught her to be brave, confident, and overcome fear. She can go out on a stage and perform a dance in front of HUNDREDS of parents. She isn’t afraid to to let go of the crate and skate across the ice. I watched, with tears in my eyes, as she just hopped off the mat and skied right down the hill, without any hesitation. 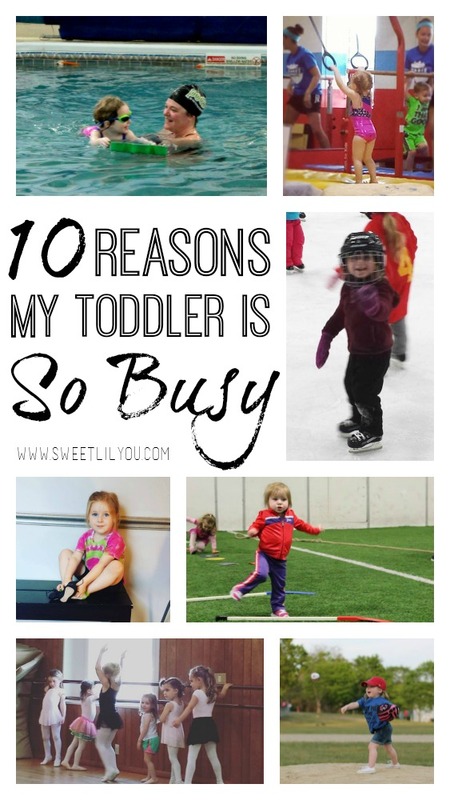 Because of all of these activities, she knows that she is capable of doing ANYTHING! She may tell me on the drive to class “I am scared of _____” but once we get there, she jumps right in, because she isn’t afraid to fail. I lacked these traits growing up, and if we’re being honest, I still do as an adult. I didn’t want Avery to grow up not trying new things because she was afraid. I look at a physical challenge and will often think “Oh no. I can’t do that. I’ll get hurt or I’ll look stupid.” Avery doesn’t even seem to look at it as a challenge. She just has the confidence that she can do it. She’s Learning Perseverance: Hockey has taught her “If you fall, you get right back up and keep going” I think this is important for all kids to know, and I’m really glad that she’s learning this at such a young age! Not once has she fallen and given up. She always gets right back up and continues…which is more than I can say for so many adults! She’s Finding Her Passion: If you don’t try something, you’ll never know if you will love it. I want Avery to try as many different sports and activities as possible. I’m not grooming her to be an Olympic athlete or world class anything. I just want to help her find the things that bring her joy. But, who knows, maybe she will find that one thing that she truly excels at! I didn’t try things as a kid (usually, because I was afraid to fail or because my parents never pushed me to try anything) and I always wondered if I had played soccer or softball, or continued dance, would I have been good at it? Maybe not, but I’ll never know, because I never tried. She’s Healthy & Strong: I don’t think this needs any explanation. If she’s on the field, or in the studio, or on the slopes, or on the ice….she’s not home on the couch. I also think getting her involved in sports at such an early age (she’s been dancing, and participating in youth sports since she could walk) really helped her with her motor skills! She’s Spending Time With Me: I know we can spend time at home, but, it’s different. At home there are so many distractions. Also, since I work from home, I’m typically busy with work and not able to give my full attention to Avery. Attending her practices, lessons, and events is fun, quality time where I am focused on her. It gives me so many opportunities to watch her grow, set and accomplish goals. She loves showing me her new skills, and I love watching her. She’s Well Rounded: Maybe at 3 or 4 this doesn’t matter a whole lot (or maybe it does? I don’t really know) But, I think dipping your toes into all sorts of activities and hobbies can only help you in the long run. There may come a point where she really focuses on one thing, but for now, we’ll try it all! She’s Saving My Sanity: Let’s be honest here, moms & dads. We don’t want to be stuck in the house every day. It’s nice to have a schedule that ensures you will have something to do. Avery also has a lot of energy. She doesn’t have an off button, or even a slow it down button. From 7am to 8pm she is ON. So getting her out of the house to burn off some energy, every day, is a must for us. She CAN! : Part of our decision to only have one child was because we wanted to ensure that we could provide every opportunity for Avery. We can afford her classes and lessons, and being that I have a more flexible schedule, I am able to bring her. So when people ask “Why?” I say “Why not?” If Avery asks to try something new, 99% of the time I will say yes. As long as it’s safe, and we are able to provide the opportunity, we’ll do it. So, there you go. That’s why my child is “over-scheduled” that’s why we are “Sooooooo busy.” I understand that our schedule isn’t for everyone, but it works for us! If this schedule ever becomes a problem for Avery, we will make changes. I know once she’s in school full time she will need to make some decisions about which activities she’d like to continue. There just wont be time for everything. Until then…we’re enjoying our busy life! So how about you? Do your kids participate in sports and other activities? One or more? 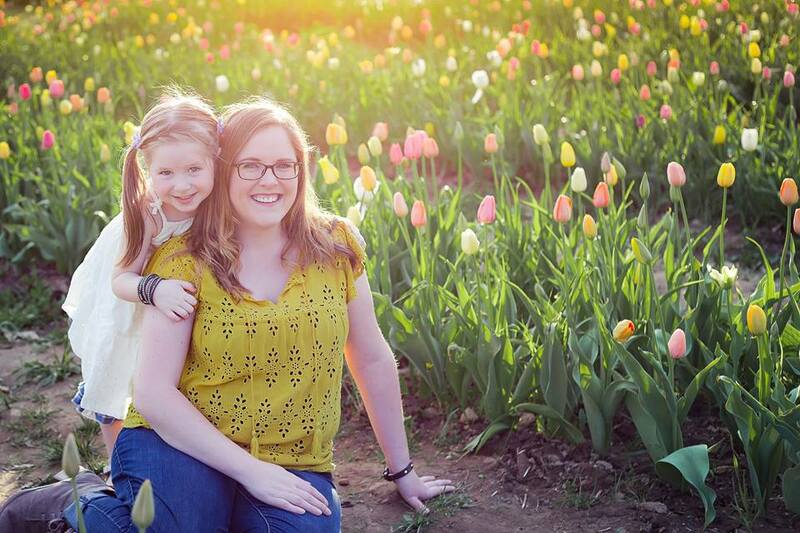 This entry was posted in Parenting and tagged activities, schedule, sports, toddler.